Whether you view your lawn as a matter of pride or as something to keep your feet from getting muddy when it rains, a healthy lawn will give you the results you want. Minimize your efforts and maximize your results by matching mowing, fertilizing, and watering to the grass’s needs, your quality goals and time available. Keep the grass healthy and you will reduce the time needed to rid it of insects, diseases, and weeds. Water Already established lawns generally need 1 inch of water each week. If your footprints remain in the lawn, the color turns a dull bluish-gray, or the leaves start to roll, it is time to water the lawn. Water thoroughly, but less frequently to encourage deep roots for drought tolerance. Mowing Never mow wet grass or mow closer than 1 1/2″. The height of the grass is a critical issue in keeping grass healthy and weeds at bay. Allowing the grass to grow up to 2″ encourages the roots to grow down, giving the grass more staying power during times of drought. Taller grasses also help shade and cool the roots, and they reduce evaporation of moisture from the soil. For best results, vary the height of your mower according to the seasons. Set the mower lower in the spring when periodic rains and cooler temps prevail. Gradually raise it to the top height (2-3″) by July when the heat sets in. Keep the mower at this height until the last mowing of the season. Then, lower the height to 1″-1 1/2″. The blades will cut the growing tips of the grass encouraging basal branching for next spring’s growth. Keep the mower blade sharp. The most common cause of brown lawns is mowing with a dull blade. Cut only 1/3″ of the length off the grass at one mowing. If you cut more than that, you over-stress the plants, leaving them more susceptible to pests, drought, and disease. Leave only 1/4″ long clippings. Such small pieces will decompose and return valuable nitrogen to the soil. Leave longer clippings, though and they tend to lodge above the soil, creating a layer of thatch that can impede water penetration, and increase disease and insect problems. Today’s mulching mowers do a fine job of chopping clippings into small pieces, and blowing them into the soil for faster decomposition. Weed Control Your best defense is a thick, healthy turf, which will actually crowd out the weeds. If weeds do emerge, treat by either pulling the roots out by hand or using a chemical herbicide. Follow mixing and use directions carefully on each package, keeping in mind herbicides are most effective when the air temperature is over 70°. There are many types and brands that do different things. All-purpose, or nonselective, herbicides kill everything that they come into contact with, weed or plant (Ex. Round-up, Finale). There are other mixtures that target certain types of plants and do not harm others, such as lawn weed killer that does not harm grasses but kills broadleaf plants like dandelions (Ex. Weed-B-Gon, Weed-n-Feed). There are also those that only attack members of the grass family (Ex. Grass-B-Gon, Crabicide). Selective grass herbicides will not be effective on broadleaf weeds. Typical situations where they are useful include grass-infested groundcover or mixed landscape beds. Preemergence herbicides prevent weed seeds from sprouting(Preen). Crabgrass can be controlled with a pre-emergent treatment. To control crabgrass apply your pre-emergent in early spring before the crabgrass seed sprouts (which is when the surface soil temperatures reach 55°F for 3 consecutive days or more). Applying herbicides can be done with a tank sprayer or ready-to-use hose-end dispenser. On a larger scale apply granular fertilizer/broadleaf herbicide formulas with a broadcast spreader. 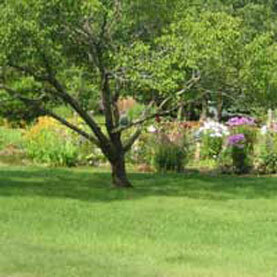 Other Problems Some common lawn problems can be addressed with proper care. Poorly growing or thin grass can be a sign of soil compaction or the wrong type of grass for a particular area. Compaction can be dealt with by aerating in the spring and fall and then overseeding with a mixture of grass seed formulated for northern climates, shade, or heavy traffic areas. Tall fescue, perennial rye, red fescue and Kentucky bluegrass are all suitable for northern lawns, since each germinates at different times to establish or patch a lawn. Best time to overseed your lawn or to start a new one in Minnesota is either early spring (April) before it gets too hot, or in the fall (mid to late August), so the lawn has enough time to establish before winter arrives. Water The most critical step in growing a strong, thick, healthy NEW lawn is proper watering. You need to keep the ground moist until the seedlings are up and established – until they’re 2 ½ to 3 inches tall. For best results, let the sprinkler run just until puddles begin to form; and do that several times a day (2 or 3 times maybe more, depending on the weather). Remember: frequent, light waterings- not once a day drenchings! Light. The amount of sun or shade in your yard. Make sure that the mix you’re considering is a good match. Remember that “shade grass” does well in light shade (4 to 6 hours of direct sun per day or lightly dappled sun throughout the day). Moisture. Be sure the water requirement for the seed you’re planting matches what’s natural for your area. If you plant a variety with high-drought tolerance, you won’t have to worry about your lovely new lawn wilting or going dormant during drier times of the year. Traffic. Some grass varieties are more resistant to the pitter-patter of little and not-so-little feet. The most attractive low-wearability grass choice won’t look attractive for long if it can’t stand up to the wear and tear of an often-used back yard, so choose accordingly. The ideal time for planting most kinds of grass is late summer or early fall. That’s the best time for germination and early growth for cool-season grasses; annual weeds are much less aggressive then, as well. Warm-season grasses can also be started as early in the spring as possible. Spread the seed. Use either a broadcast or a drop-type spreader. For best coverage, plant the seed in two passes: half at a time, at right angles to each other. Rake or tamp. Give the seed good contact with the soil by raking or tamping it lightly, barely covering it (seed needs light to grow). Dragging an ordinary garden hose over the seeded surface works well. Mulch, for best results. Mulch holds in moisture, to help the seeds sprout. Compost, peat, straw and cheesecloth all work well, but keep it light, so sun and water can get through to the seed. Soil & Water Apply a thin layer of compost to the lawn every spring and fall. A bagged compost or soil conditioner is ideal. Spread ¼ to ½ inch of compost over the lawn. Rake it into the grass, then water. Compost materials that contain worm castings, small amounts of organic fertilizers or beneficial microbes are especially appropriate. If the condition ofyour soil is poor add one more feeding during the green season. Water deeply once or twice a week. Mowing Look for an earth friendly push mower. Start with a sharp mower blade and set it at 3 to 4 inches. This helps crowd out weeds, keeps moisture in the soil and supports deeper roots. But the most important mowing strategy of all is to leave grass clippings on the lawn to decompose. They are a great source of free nitrogen. Leave just enough of them on the lawn to decompose without getting in the way. Thatch A lawn that has been treated with chemicals for years may have biologically inactive soil. This condition prevents organic matter from breaking down. The result: a layer of thatch that blocks healthy growth. A simple aerating tool can make the job easy. Do this twice a year in spring and fall and follow it immediately with feeding the soil. Weeding For small lawns the correct hand weeding tool may be the solution. For large lawns, the organic pre-emergent corn gluten is a great alternative to chemical weed products. It suppresses new seedlings. Apply a 40lb per 2,000 square feet. Fight Bugs With Bugs Organic pest control often involves introducing the pest’s natural predator. Nematodes are microscopic worms that burrow into lawn grubs or flea larvae and kill them. Organic pest control companies sell a specific species of Nematodes that are effective against Japanese Beatles, chafer grubs and other common lawn pests. Another option to control Japanese beetles as milky spore, a naturally accruing bacteria that kills the beetles in the grub stage. Check out our helpful lawn care calendar below. April Repair damaged areas with a Lawn Repair Kit or Patch. Apply Crabgrass Preventer to established loans, to stop crabgrass seed from germinating (apply before temps reach 55°F, 3 days in a row). May Seed lawns (can't do if crabgrass preventer applied in April) or lay sod. Fertilize established lawns with No Phosphate lawn food (or Weed and Feed). Begin mowing (not lower than 2 1/2"). June Apply Weed & Feed to established lawns with No Phosphate, if not done in May (weeds should be actively growing, have lawn foliage moist). Mow regularly. July Only irrigated and highly managed lawns can be fertilized this month. Keep mowing! A lawn needs 1" of water per week. Irrigate if no rainfall. August Plant seed or lay sod from mid to late August. Repair bare areas with a Lawn Repair Kit or Patch. Irrigate lawns, if no rainfall. September Early to mid September –can still lay sod or seed new lawns. Fertilize and use a weed killer to get rid of perennial weeds (use No-Phosphate Weed and Feed, or Weed B Gone). October Apply Winterizer or High Nitrogen, Phosphorus free fertilizer.This is the most important fertilizing application for your lawn.